A content delivery network (CDN) is a large distributed system of servers deployed in multiple data centers in the Internet. The goal of a CDN is to serve content to end-users with high availability and high performance. The multiprotocol extensions of BGP has been used to carry many types of information. I stumbled across a great progression on the idea from this NANOG presentation from the guys at Comcast. 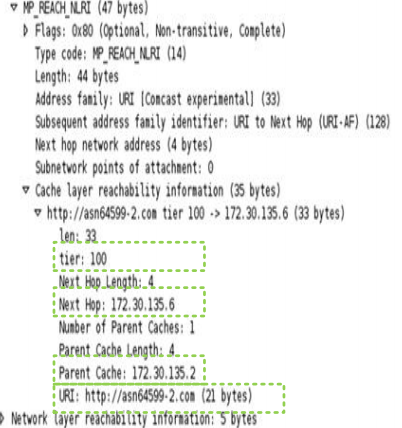 Here's their packet capture screenshot. Notice the Address Family - URI.